Ashley graduated with honors from Canadian Therapeutic College in 2010. After taking a 1.5 Year Maternity leave, she started working from home in May of 2012. 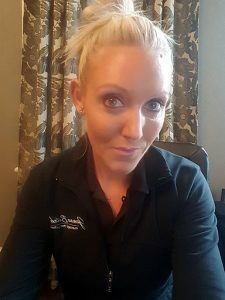 She has worked in the community of Sioux Lookout as a successful clinic owner for the past 4 Years, both on her own and with a Chiropractor and Optometrist. Ashley has spent the last 10 months working in a Premium Fitness facility, in Thunder Bay, ON. ; Which has given the opportunity to work with athletes to help with rehabbing various injuries & ailments. Health and Wellness is a very important part of her life and is something she is passionate in helping people with. Ashley is committed to helping people and motivating them to be the very best version of themselves. She assesses each client individually, as each person is unique, and may require special attention. She is committed to helping individuals pursue their goals in the realms of offering the body greater freedom from fascial and trigger point restrictions, emotional blockages, losing weight, exercising, decreasing stress levels, eating more healthily, building stronger, more flexible bodies, breath control, and in quieting the mind.